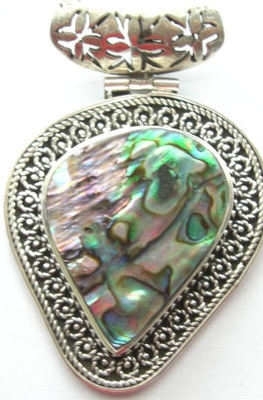 Super multi coloured ever popular mother of pearl silver pendant. This mother of pearl piece is fashioned in a pretty teardrop shape(almost heart shaped) and i s so pretty with those gorgeous mixed shiny luminous colours of blues greens and pink only really found in mother of pearl. Set in silver it is surrounded in a pretty intricate pattern of alverwork in an open filigree design with the bail at the top having another piece of silver with open design to enhance the whole pendant.